Why is Haleakalā a National Park? Haleakalā National Park was established on August 1, 1916. It originally encompassed a 21,150-acre area. Today, the park spans 34, 294 acres and over 1.2 million visitors come to enjoy the park every year! Long before the Haleakalā area was designated as a National Park, the land supported a large population of people. Native Hawaiians have lived on and cared for the Haleakalā landscape for over 1000 years. The area is an appealing place to live because it has a large water supply, mild climate conditions, and an ideal terrain to use for agriculture, such as growing taro plants. Today, the park protects the bond between the land and its people through the preservation efforts of these beautifully ideal conditions. It also echoes stories of how the area was valued in the past and continues to be valued in the present. This area is considered sacred to native Hawaiians and there are many important cultural sites within the national park. The word Haleakalā actually means “house of the sun.” Legend says that the demigod Maui caught the sun at the summit of Haleakalā and forced it to slow its journey across the sky. According to legend, this created a more comfortable life for Hawaiians. After the Wilkes U.S. Exploring Expedition investigated the area in 1841, word spread about the beauty of the park. People came from all over the world to hike to Haleakalā’s summit. Tourist interest in the area was the primary force responsible for the area becoming a National Park in 1916 and an International Biosphere Reserve in 1980.
International Biosphere Reserves are areas that are made up of terrestrial, marine, and coastal ecosystems. These reserves are nominated by national governments and are internationally recognized. In turn, the area is protected by both its national park status and its reserve status. Haleakalā National Park was created to protect the land and species that inhabit it. The purpose of the park is for it to remain a natural area. The National Park Service works to achieve the park’s purpose through various efforts and partnerships with local organizations. As part of this effort, they continue to re-establish ecosystems that would have evolved here without the past interference of man. 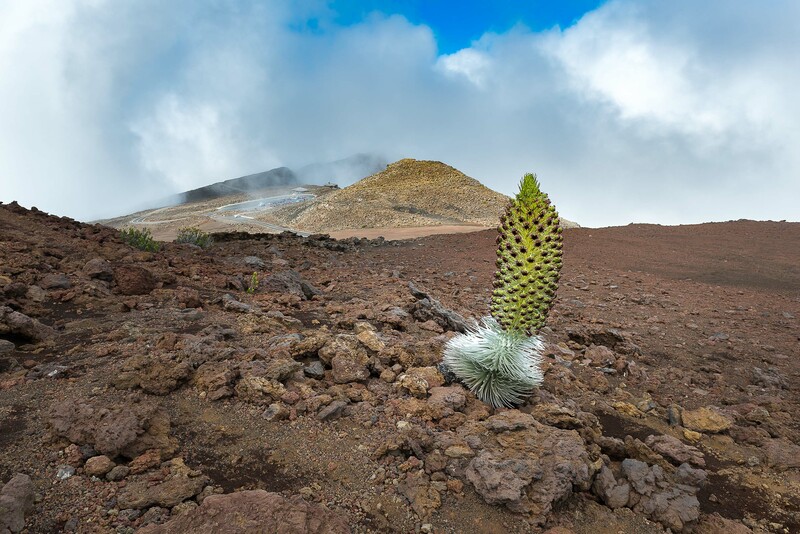 One ecosystem is the rocky alpine aeolian zone that is home to the endangered Silversword plant. The National Park Service is also preserving native ecology such as the plants and animals that live in various regions of the park. 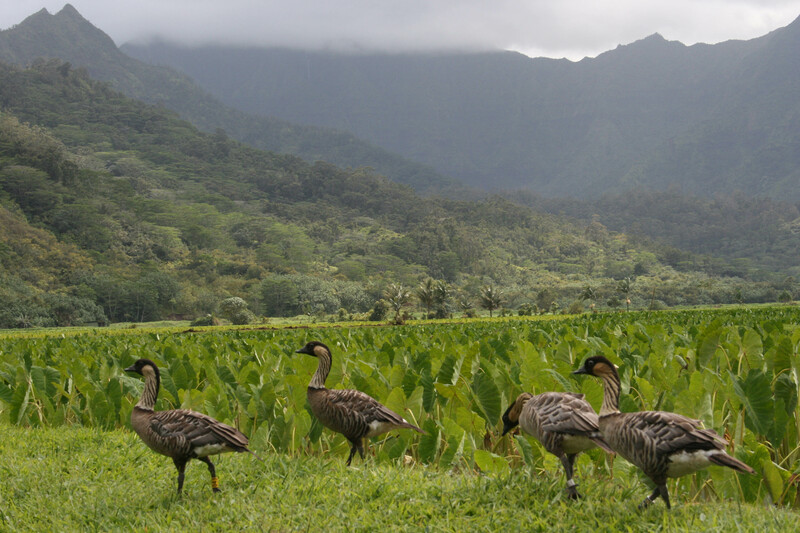 An example of a protected species that can be found in the park is the state bird of Hawaii, the Nene goose. More than 90% of the native plants and animals found in Haleakalā National Park cannot be found anywhere else in the world. This is in part because the Hawaiian Islands are the most remote major island group on the planet. They are located 2,400 miles from the nearest continent so new plants and animals rarely are able to cross the ocean without the assistance of a boat or plane. The National Park Service works to control the populations of non-native plants and animals that threaten these unique native species. They are also preventing areas from changing from their original conditions any more than they already have been changed throughout history. Some areas of the park were once manipulated by residents to use for farming. Some of these areas were changed so long ago that it is very difficult to return them to the state they were in before humans lived there. The National Park Service implements traditional Hawaiian methods and modern methods for the preservation of natural resources. Many of the traditional conservation methods that are used are rooted in traditional Hawaiian religious beliefs. These include respecting nature as it is, staying out of forbidden areas, respecting the living earth, living in unity with the balanced earth, and caring for nature. Some modern conservation methods that the National Park Service employs are new technologies and scientific research findings. For example, they use GPS data to find park locations that need extra attention or care. The area is meant to be a protected natural area that visitors can enjoy and that scientists can investigate. The National Park Service teams up with the community to protect, manage, and interpret the unique resources for the education, experience, and inspiration of future generations. They incorporate Native Hawaiian protocols and generational knowledge that has been passed down for many years to preserve Hawaii’s cultural resources that are located in the park. There are so many things to learn and enjoy in Haleakalā National Park. This International Biosphere Reserve is home to many unique plants, animals, and landscapes. It is no wonder why the lands located in this beautiful park have been a meaningful part of Hawaiian culture for thousands of years. 1828: First written record of an ascent to the summit of Haleakalā is made by three missionaries. 1841: Wilkes U.S. Exploring Expedition investigated Haleakalā Crater. 1888: Haleakalā Ranch is established. Grazing of cattle begins on the slopes of Haleakalā. Cattle are pastured in Haleakalā Crater until 1922. Ranching is established in Kīpahulu after sugar production ends in the mid-1920’s. 1916: Haleakalā National Park is established by Congress. 1933-1935: The road to the summit of Haleakalā is built. 1934-1941: Early National Park Service park development (Civilian Conservation Corps). Haleakalā Visitor Center at summit is built in 1936. The backcountry cabins were built in 1937. 1946-present: Later National Park Service development in Haleakalā National Park. Park Headquarters is built in 1958. Observatory built at Red Hill in 1963. 1951: Kīpahulu Valley is added to Haleakalā National Park. 1962-1978: Nēnē Goose reintroduced into Haleakalā National Park. 1974: Crater Historic District is listed on the National Register of Historic Places. 1976: Fencing of park boundary begins. The fencing is designed to exclude feral animals such as goats and deer in order to protect park resources. This work continues today. 1999: Kaapahu lands are added to Haleakalā National Park. 2008: Nu`u lands are added to Haleakalā National Park.